19 July 2016, Rome - A new FAO report helps to fill a significant knowledge gap on the presence and extent of forests and trees in the world's drylands, where the food security and livelihoods of millions of people, already precarious, are increasingly being threatened by climate change. Issued today, the study's preliminary findings - the full report will be launched later this year - show that trees are present with hugely varying densities on almost one-third of the world's 6.1 billion hectares of drylands, which cover an area more than twice the size of Africa. Almost 18 percent of this area contains forests. An estimated 2 billion people, 90 percent of whom are in developing countries, live in drylands. Recent studies have indicated the need to restore these areas to cope with the effects of drought, desertification and land degradation. 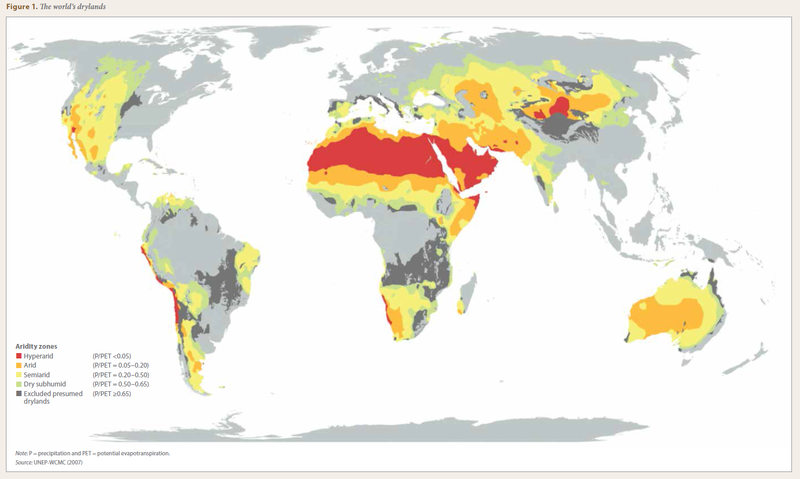 In particular, water availability in drylands is expected to decline further due to changes in climate and land use. Poor people living in remote rural areas will be most vulnerable to food shortages, which combined with violence and social upheaval, are already leading to forced migration in dryland regions in Africa and western Asia. Until now, there has been little statistically based knowledge on dryland trees - particularly those growing outside forests - despite their vital importance to humans and the environment. The leaves and fruit of trees are sources of food for people and fodder for animals; their wood provides fuel for cooking and heating and can be a source of income for poor households; trees protect soils, crops and animals from the sun and winds, while forests are often rich in biodiversity. As the first statistical sampling-based assessment of land use in the world's drylands, the FAO study provides a baseline for monitoring changes in dryland forests, tree cover (density), and land use. It provides governments, donors and other stakeholders in sustainable development with a valuable tool to guide policy-making and targeting investments. Using satellite images available publicly through Google Earth Engine, Bing Maps and other sources, FAO's study draws information from over 200,000 sample plots each measuring approximately 0.5 hectares. The sampling error for the estimate of the total forest land for all drylands is about +/- 1 percent. The satellite images were interpreted using Collect Earth, a tool in the Open Foris suite of free, open source software developed by FAO's Forestry Department to make it easier for experts from around the world to collect, analyse, report and share data. Drylands are divided into four aridity zones (see map): the dry subhumid zone, is the least arid of the four zones and consists mostly of the Sudanian savanna, forests and grasslands in South America, the steppes of eastern Europe and southern Siberia, and the Canadian prairie. Most dryland forests occur in this zone, as do some large irrigated, intensively farmed areas along perennial rivers; at the other extreme, the hyperarid zone is the driest zone and it is dominated by desert - the Sahara alone accounting for 45 per cent, and the Arabian desert forming another large component. The study indicates that grassland constitutes 31 per cent of land use in drylands, forests 18 percent, cropland 14 per cent, wetland 2 percent and human settlements 1 percent. The largest portion, 34 percent, which is categorized as "other land", consists largely of bare soil and rock. While the new study reports results on global and regional levels, FAO is ready to assist in adapting the methodology for country-level assessments on request. These in turn could enhance the ability of governments to track progress made in achieving the Sustainable Development Goals (SDGs), in particular SDG 15, which focuses on sustainably managing forests, combating desertification, halting and reversing land degradation and halting biodiversity loss. The study methodology is being already used for the baseline assessment and monitoring in the FAO-implemented project, "Action Against Desertification" an initiative of the African, Caribbean and Pacific Group of States (ACP). Over four years, until 2019 ACP, the European Union, FAO, the African Union Commission and other partners will support six African countries - Burkina Faso, Ethiopia, the Gambia, Niger, Nigeria and Senegal - as well as Fiji and Haiti in improving the condition and productivity of land affected by degradation, drought and desertification. The global drylands contain 1.11 billion hectares of forest land, which is 27 percent of the global forest area, estimated at approximately 4 billion hectares. Two-thirds of the drylands forest area can be defined as being dense, meaning it has closed canopies (i.e. a canopy cover greater than 40 percent). The second most common land use in drylands is grassland (31 percent), followed by forest (18 percent) and cropland (14 percent). The category other lands constitutes 34 percent of the global drylands area. The least-arid zones have the most forest. The proportion of forest land is 51 percent in the dry subhumid zone, 41 percent in the semiarid zone, 7 percent in the arid zone and 0.5 percent in the hyperarid zone. The average crown cover density is ten times higher in the dry subhumid zone than in the hyperarid zone. Trees outside forests are present on 1.9 billion hectares of drylands (31 percent of the global drylands area), if all land with more than 0 percent crown cover is included. Thirty percent of croplands and grasslands have at least some crown cover, as do 60 percent of lands classified as settlements. Larch trees in Mongolia's Altansumber forest. Baobab trees in Niger. The leaves and fruits are sources of food for people and fodder for animals.